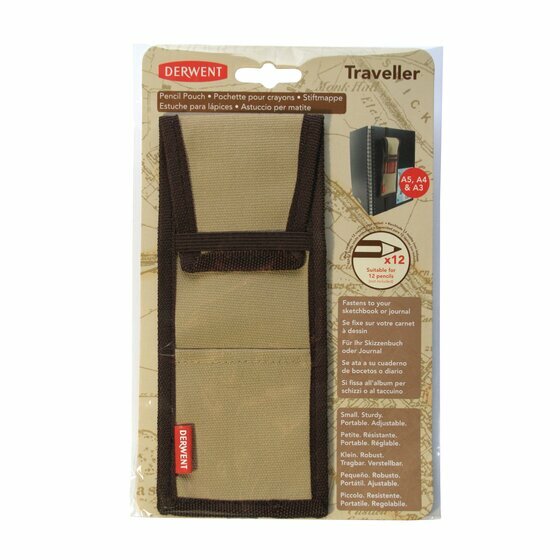 Secure your pencils to your sketchbook or journal with this pocket sized pouch. Great for working outdoors, it securely fastens to your sketchbook with an adjustable elastic fastening. Suitable for 12 pencils, the Traveller has two compartments to hold pencils and a flap which folds over and protects the tips. Secure your pencils to your sketchbook or journal with this pocket sized pouch. Great for working outdoors, it securely fastens to your sketchbook with an adjustable elastic fastening. Suitable for 12 pencils, the Traveller has two compartments to hold pencils and a flap which folds over and protects the tips. It is easy to select the pencil you want whilst you work in your sketchbook. Small, sturdy, portable, adjustable – perfect pencil storage!